[…] called up one of the donors, Jason Fried, chief executive of 37signals, a hip business-services company, who recently gave an undisclosed amount to Khan Academy, to find out what the attraction was. A review of the comments appended to the article suggest that many readers agree that higher education faces serious competition from online knowledge repositories. What the article misses however, is consideration of the conversion of information acquisition/collection to personal knowledge. Schools such as MIT, through their support of the OpenCourseWare Consortium, have demonstrated their understanding that the real value of higher education is not the downloading of knowledge through texts and lectures, but rather through the production of new and personal knowledge that their unique environments offer. This tacit, added values provided by the institutions are what define quality higher education. 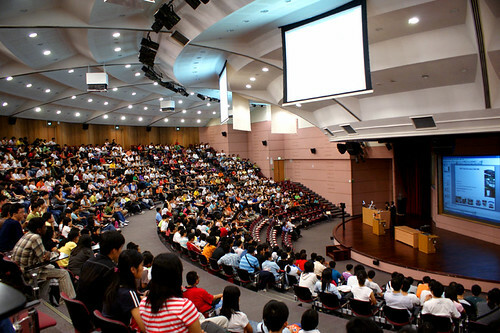 European colleges and universities are notorious for having embraced lectures over other course formats (i.e., seminars, laboratories). In these environments, student learning does not occur as much within lecture halls as it occurs outside of the classroom — through interactions with other students, individual and informal study groups, independent or directed research, etc. In the age of YouTube lectures, universities need not worry about their bubbles bursting, but rather, what they should be doing in the classrooms instead of lecturing.